Any candy that includes peanut butter is sure to be a customer favorite, and our luscious peanut butter pillows are no exception! This product is sold under our flagship Pennsylvania Dutch Candies™ brand as Peanut Butter Pillows and Katharine Beecher® Duets. 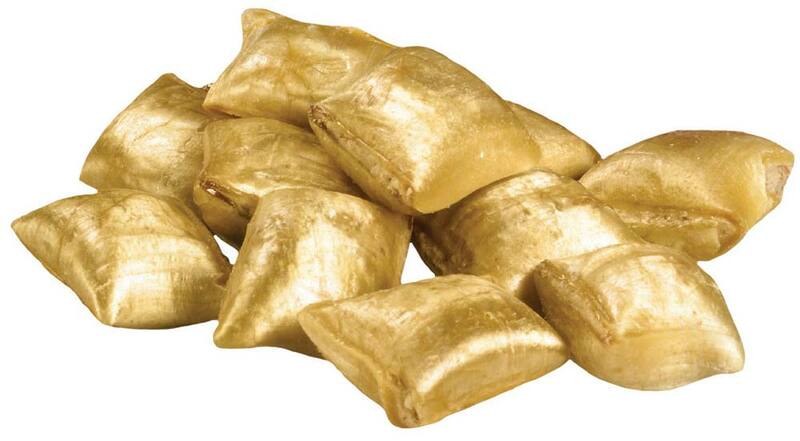 Our peanut butter pillows are an old-fashioned candy treat that always have consumers coming back for more. You’ll want to make them a staple in your candy offerings. Our peanut butter pillows are a favorite old-fashioned delight found in many “mom & pop” candy and variety stores, nostalgic stores, gift shops and specialty retailers across the USA. Grandparents love to buy these sweet treats for their grandkids to give them a taste of what old-fashioned goodness is really like! What Is a Peanut Butter Pillow? Our traditional peanut butter pillows consist of a flaky center featuring paper-thin layers of peanut butter. The hand-pulled satin shell surrounds the center and provides the perfect crunchy finishing touch. Our peanut butter pillows are popable, fun – to – eat treats and kosher certified. The reason we call our peanut butter pillows “old-fashioned” is that that they’re not produced in huge quantities by modern machinery. Instead, we make them completely by hand in our fully equipped batch-cooking kitchen located in our 200,000-square-foot Camp Hill, PA production facility that is used exclusively for our specialty products. As with our machine-manufactured candies, our peanut butter pillows undergo a stringent quality-assurance process to ensure they always meet customer expectations. Whether you’re a retailer who is looking to add a nostalgic candy to your inventory or a candy lover who is longing for an old-fashioned candy flavor experience, peanut butter pillows are the perfect choice. The Warrell Corporation is a high-volume, major manufacturer of candy across the U.S. .No matter how big or small your business is, we can meet your needs. Give us a call today!